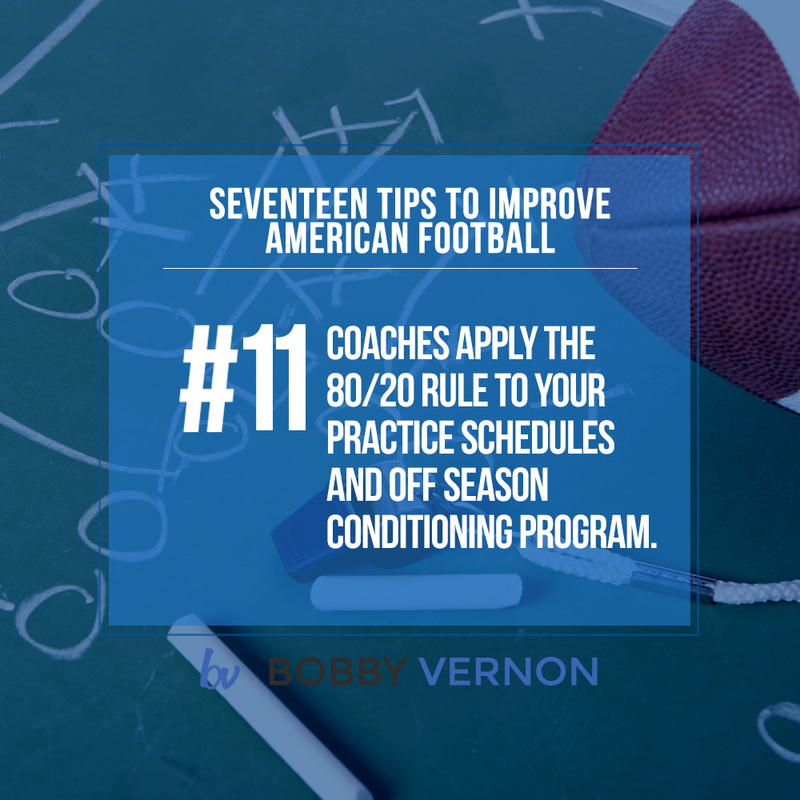 Tip #11 – Football coaches should apply the 80/20 principal to their practice schedules and off season conditioning programs. Football coaches would benefit from thinking about how often this principal can be seen in football..
Sound about right? How about one more? 20 percent of time spent produces 80 percent of the results. If this is true in business and economics. It certainly holds true in football. Now, I’m not suggesting that players and coaches should simply spend 20 percent of the time they currently spend practicing and training for football in season. However, if 20 percent of the time spent is responsible for 80 percent of the results, think about how little might actually be sacrificed if we were to reduce our time spent in season by just 20 percent. We would be providing our players more time to rest, study, and spend time with their families. What would we lose? I believe the answer is nothing. In fact, I believe the results would actually improve if most coaches and players spent 20 percent less time training and practicing, as long as the remaining time was optimally spent. I believe that at least 20 percent of the typical time spent by coaches and players is responsible for 80 percent of the injuries, fatigue, and burnout experienced by so many in amateur football today, particularly at the high school and college levels. And the only reason so much time is spent on the game is the ridiculous but deeply rooted belief that time spent equals work and effort, and is directly proportionate to results. In other words, whoever spends the most time achieves the best results. This just isn’t true—not in business, not in exercise, not in relationships, and certainly not in football. When it comes to time, quality is much more important than quantity.